After all the sightseeing we had been doing on Thursday and Friday, it was time for a day of rest and relaxation (though I can’t say working on taxes was all that relaxing)! 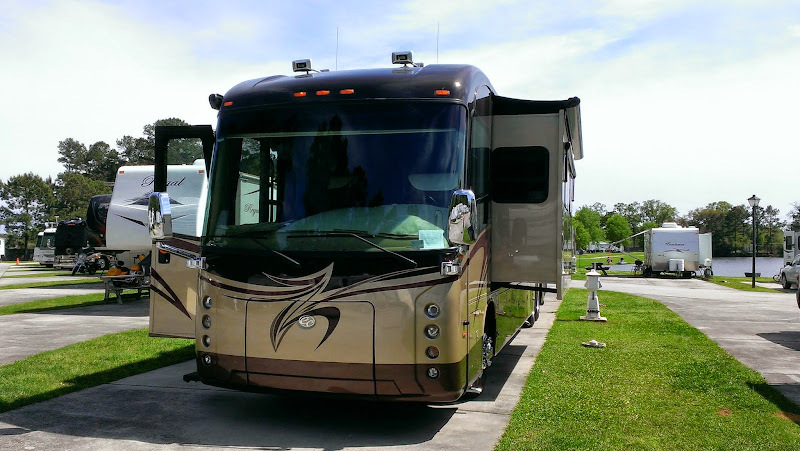 Our original plan was to leave Cypress Bayou on Sunday, the 6th, and head east to spend 2 nights at Tickfaw State Park in Springfield, LA. But once again, Mother Nature had different plans for us! 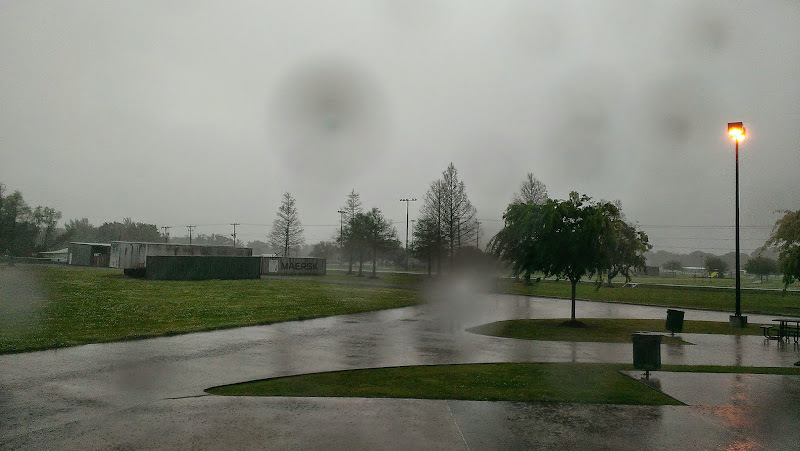 On Friday, they were forecasting torrential downpours with at least 5″ of rain and flash flood warnings in the area around Cypress Bayou on Sunday. Since Tickfaw State Park in Springfield, LA is located on a river which often floods during heavy rains, causing the campground to close, we decided it wasn’t a good idea to head there. A change in plans was most definitely required. So we cancelled our reservation at Tickfaw and went to the Cypress Bayou hotel to see if we could extend our stay there by one more night. Sure, no problem. 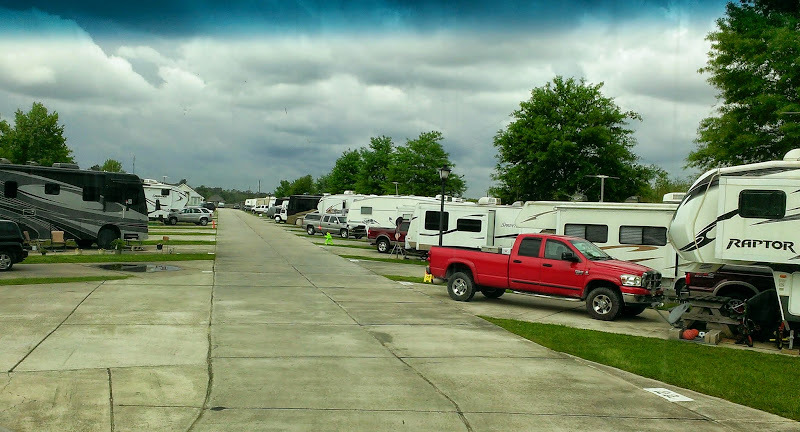 Now we needed to find another place to stay on higher ground for Monday – we ended up making a reservation for the night of the 7th at Lakeside RV Resort in Livingston, LA. We had already made a reservation to return to Topsail Hills State Park in Santa Rosa Beach in Florida beginning on the 10th so we didn’t have a lot of flexibility in our schedule. Early Sunday morning, Rob’s phone started beeping again with all sorts of alerts for upcoming weather. Darn, not again! We braced ourselves for the oncoming onslaught of torrential rain and severe thunderstorms but despite being very dreary, very overcast and looking like a major storm was brewing, there was no rain. What the heck??? Oh well, Mother Nature does what she wants to do, when she wants to do it! Well, finally later in the afternoon the heavens opened up and it started pouring. By now there was a severe t-storm warning, a tornado watch and a flash flood warning until 11 pm that night. Okay, we would have to deal with that but in the midst of all the weather issues we had another situation which was a cause of concern. Mr. Gizmo was in and out of the litter box every few minutes. He would sit there, then sit there some more with this mournful look in his eyes because nothing would happen. The good news was that he was eating, drinking and running around like a maniac so except for jumping in the litter box frequently, he seemed fine. But it was of concern since male cats are noted for developing urinary blockages which can be life threatening. Just in case he took a turn for the worse that night, I started Googling local vets, but of course all of them were closed on Sunday. Great! Why do pets always manage to get sick or have a problem on a weekend? As the afternoon dragged on, the winds started howling, causing the beast to shake! And of course, there were numerous very bright bolts of lightning, quickly followed by booms of thunder. Yikes! Being out in the open, in the middle of a parking lot without much around us sure didn’t make us feel warm and fuzzy. Then again we’ve experienced similar weather in our previous sailboat which had a 45′ metal pole sticking up into the sky – that was even less fun! The worst part though was the tornado watch – what would we do if it turned into a tornado warning? Guess we would grab the kitties and head up to the casino and wait it out. I have to say that the electrical storms in the south seem much more intense than the ones back in New England. They are scarey! Don’t know if I’ll ever get used to them! Fortunately the tornado watch didn’t turn into a warning but it was another sleepless night. I figured if we could make it until 11 pm we would be out of the woods, but as 11 pm got closer the warnings were extended until 3 am. Then they were extended until 6 am on Monday morning. Oh great, this was going to last all night! I guess some time during the night we did manage to fall asleep for a bit but needless to say, in the morning we were pretty tired. Now that the weather was better, I still had to do something about Gizmo so first thing on Monday morning I started calling local vets – we needed an appointment in the morning so we could hopefully leave by check out time. 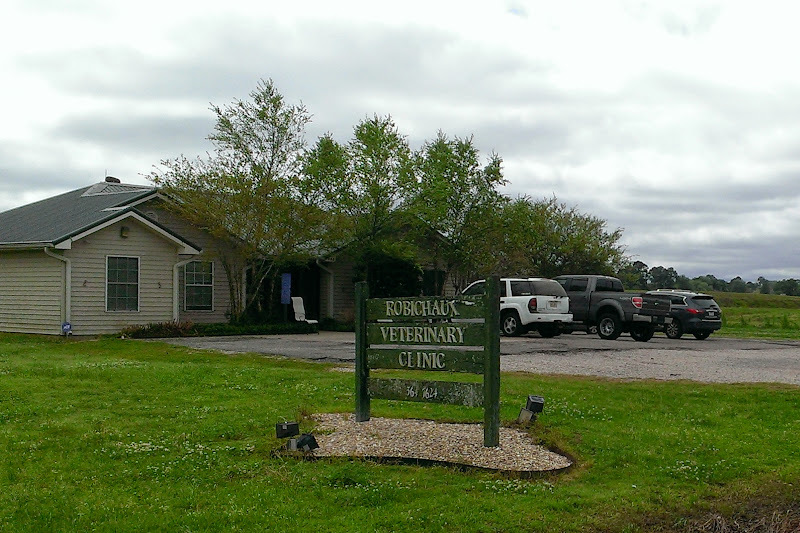 The second vet I called, Robichaux Veterinary Clinic in New Iberia had an appointment for 10:30 am. Woohoo, that would work! Since we had some time to kill, we started getting the coach ready for our departure, then put a very unhappy Gizmo into his pet carrier for the 20 minute drive. Meow, meow, meow was the only thing he had to say about that! 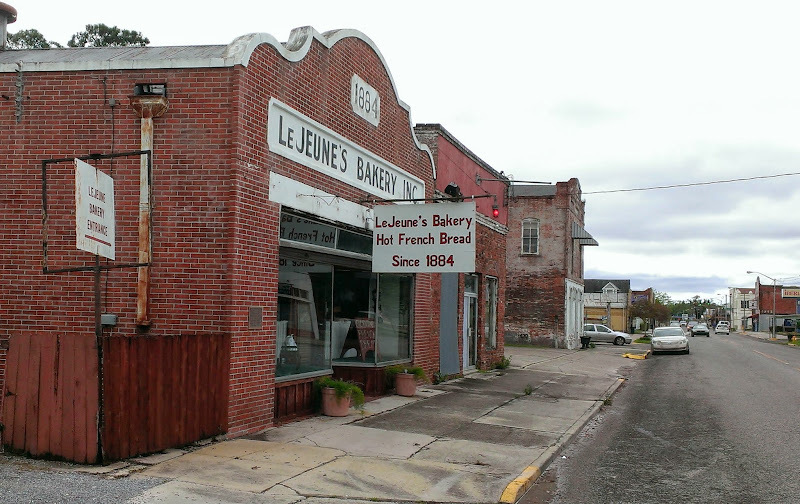 On our way, we passed LeJeune’s Bakery where we saw the red light was on outside. I had read that that meant the bread had just come out of the oven so we decided to stop since we knew that we would most likely be early for our appointment. 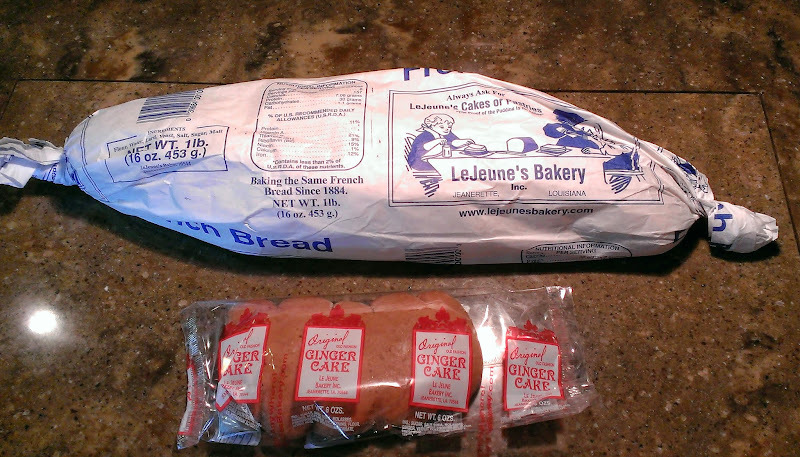 LeJeune’s has been baking French bread and ginger cakes since 1884. 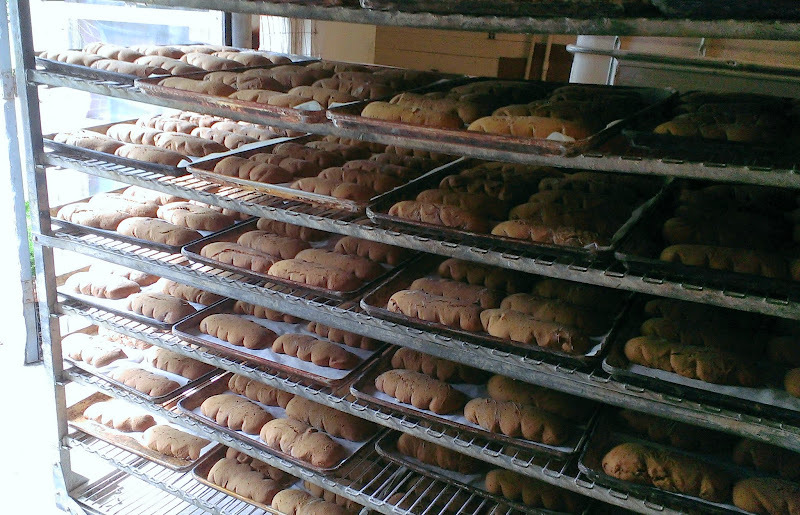 No automated process here – each loaf of bread and each ginger cake is made from scratch! They don’t have a counter in the front because they are too busy making the bread so you have to go in the side door and catch someone walking by. Five minutes later we left with two loaves of bread and two ginger cakes. The French bread was delicious and the ginger cakes were good but not my cup of tea! I probably wouldn’t buy them again. It was only another 10 minutes to the clinic. As we walked in the door, we were greeted by a very friendly woman at the desk and within minutes, Gizmo was on the examining table being examined by Dr. Robichaux who was excellent. Some vets seem to favor dogs more than cats but he definitely was a cat lover, talking a lot about his own cat. He decided based on the examination, G’s symptoms and his behavior that he had a urinary tract infection and gave him two antibiotic shots – one for short term and the other long term. Whew, what a relief that it wasn’t anything more serious! By that night, Gizmo had returned to his normal self and has been fine ever since! After paying the bill (wonder if little kitty is scamming us and gets a kickback from the vets? ), we left, heading back to the coach where we quickly got ready to leave, finally departing around 12:30pm. Luckily it was only a two hour drive to Livingston, LA but our first leg after leaving the casino was a straight run up to Lafayette on our favorite road (NOT), US-90. At first we thought we wouldn’t be tortured by the ka-THUNKS as the first part of the highway seemed better than the sections we had been on previously, but nope within a few minutes, it was bbbbaaaccckkk! …ka-THUNK, ka-THUNK, ka-THUNK. AARRGGHHH! As mentioned in our last post, a lot of the gas stations had small casinos in addition to convenience stores. 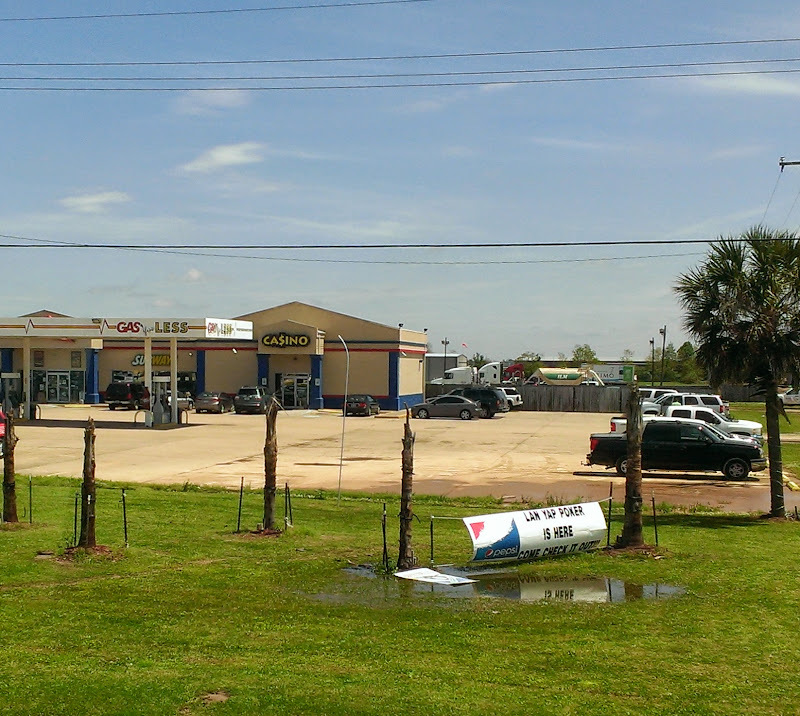 Seemed like each small town had two or three gas station/casinos. As we approached Lafayette where we would pick up I-10, the roads there got even worse (hard to imagine)! ka-BAM, BAM, BAM! (that’s worse than a ka-SLAM which is worse than a ka-THUNK). 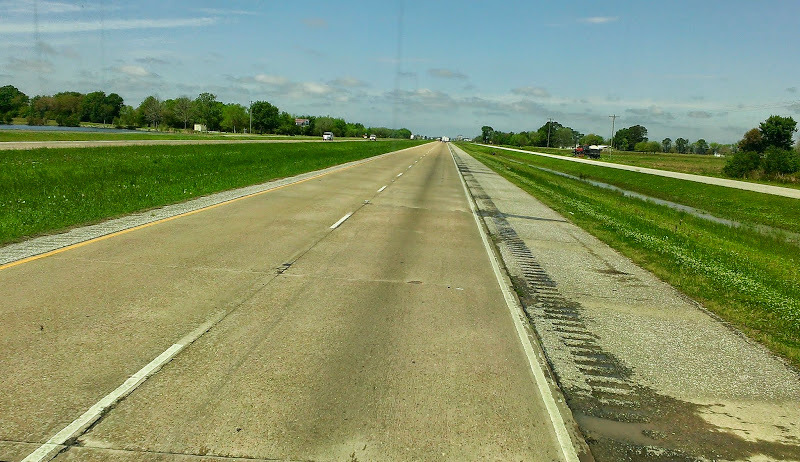 Even I-10 heading east was disappointing but it did eventually smooth out as we approached Baton Rouge. Thank goodness! 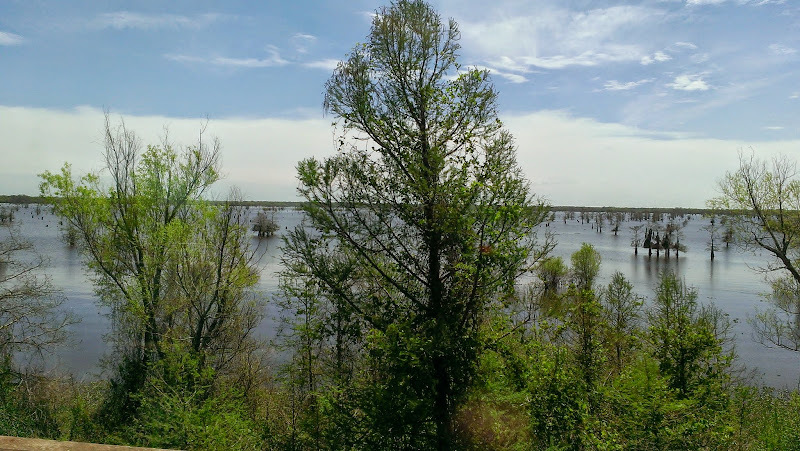 Since much of Louisiana’s landscape is made up of bayous, rivers, lakes and swamps, we crossed some very long causeways built on stilts – there was water, water everywhere! We were both wondering how they ever built these roads…must have been pretty difficult and dangerous with all the critters in the swamps. Finally we arrived at the Lakeside RV Resort around 2:30 pm where we stopped to check in at the office. During our conversation about the weather, we learned that during the storm the day before a tornado touched down nearby. We were assigned a pull thru site, #83. The rate here was $42.00 plus tax so after a 10% Good Sam discount, our cost for one night was $41.95 which basically just covered the tax. We felt the rate was a little (ok, a lot) high for the type of place it was and where it was located but it was a convenient stopping point and easy to get to. We were escorted to our site by a gentleman in a golf cart. The roads were cement and the sites were cement with grass on either side – our pull thru was very long so there was enough room to leave the van attached, but the sites were very close together with no shrubs or anything to offer privacy. In fact the sites were so close together, there wasn’t room for a full picnic table! Instead we had half of a picnic table! Hmmm I wonder does this mean we can only have half of a hamburger or hot dog? Ha! The “table” cleverly flipped 90 degrees and could also be used as a bench – good thing as there wasn’t much room for regular chairs! Other amenities offered at this park include a swimming pool, fishing in their private 18 acre stocked “lake” (more like a big square puddle), clean and modern (so they say, we didn’t check them out) bath and laundry facilities, two lake view indoor/outdoor pavilions with AC and kitchens available for functions, playground, enclosed dog park, a small store, free wi-fi (very slow), garbage pickup at your site and concrete walking paths. Definitely a family kind place, there were kids everywhere which was okay but it was kinda noisy. 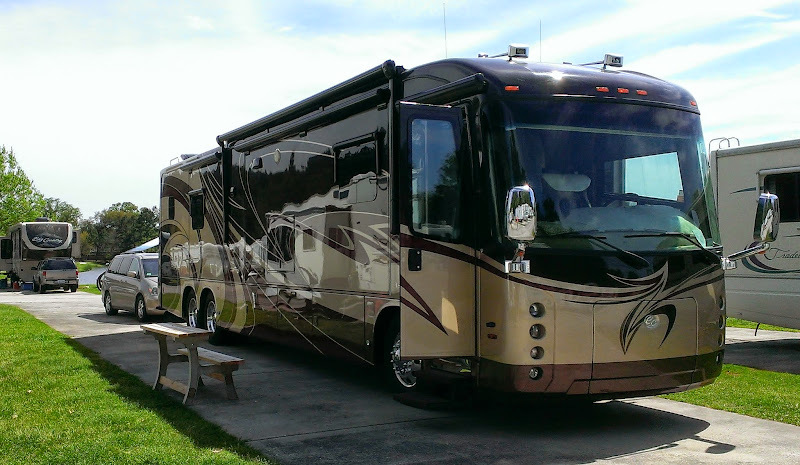 We found this to be an easy overnight stopover but would not consider it a destination park. However, apparently many of the folks here do based on the number of obvious long term residents. Guess we are getting spoiled by the large sites at state and federal parks. Once we got settled, we decided to take a ride to a nearby Sam’s Club to pick up some supplies. The rest of the night was uneventful. The next morning it was time to hit the road again, more exciting reading in our next post! Lejeune’s would be just up my alley. I love bread. Happy that Gizmo is fine.